Dubai is hub of business in UAE. In fact, the fame of UAE as a business-friendly country is mainly due to the emirate of Dubai. Since past several decades, Dubai has been attracting foreign entrepreneurs due to numerous incentives and facilities it offer to all types of businesses. An important reason that variety of businesses are flourishing in Dubai is due to the possibility of opening different types of companies in Dubai. All these different types of companies have their own requirements, benefits and limitations. These different types of companies are suitable for various types of businesses according to their requirements and priorities. There are mainly 5 types of companies that can be established in Dubai. These companies can be established in Dubai mainland, several free zones and offshore jurisdiction. Following are the names and characteristics of different types of companies that can be established in Dubai. This is the most common type of company that operates in Dubai mainland. By setting up LLC (Limited Liability Company), businesses can make sales to Dubai and other parts of UAE. Minimum 2 and maximum 50 shareholders are required for setting up a Dubai-based LLC. Most notable limitation for foreigners is that only 49% shares of company can be owned by foreign entrepreneurs while a local Emirati will hold 51% shares of LLC (these rules are relaxed recently for SMEs). But 51% share doesn’t require distribution of profits with same ratio. Foreign entrepreneur and an Emirati partner can set their profit-sharing separately. It is also possible to pay a specific amount to local sponsor instead of making him partner in company’s profit. There are 45 free zones in UAE and more than half of them (around 30) are present in Dubai. It shows the importance given to these free zones in Dubai. There are two main types of companies allowed in free zone entity. Free Zone Company (FZC) is very much similar to LLC in Dubai mainland with the requirement of minimum 2 shareholders. On the other hand, only a single shareholder (individual or corporate) is required to setup a Free Zone Establishment (FZE). Main advantage of companies established in free zones is that they can be fully (100%) owned by foreign entrepreneurs. Apart from that, these companies are mostly tax free. There are also several free zones in Dubai that are free from value added tax (VAT). But there are also few restrictions applied on these companies. These Dubai-based free zone companies are only allowed to operate within their specific free zone and can only perform activities permitted in their license. Civil company is a special type of company aimed for the progress of professionals of various fields including doctors, engineers, lawyers, accountants etc. Such types of company are fully owned by professionals but a UAE Local Service Agent (LSA) is required for accomplishment of legal issues. If a foreign company is in the same field, then it can become a partner of the civil company. A local or foreign company can setup its branch or representative office in Dubai mainland and most of the free zones in the emirate. Branch office and representative office has almost the same establishment procedure and requirements, but they serve their parent companies differently. A branch office conducts same types of business activities according to that of its parent company. But it can’t import products of its parent company. This office is established under the name of its parent company. On the other hand, representative office can only promote activities of its parent company. Like civil company, appointment of a local service agent is required for both branch office and representative office of both local and foreign companies. 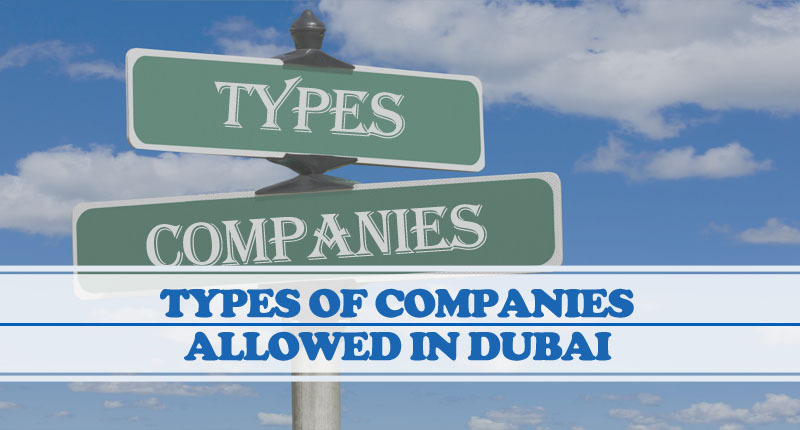 These are main types of companies that can be established in Dubai. If you want to open any of these companies in Dubai, then we at Riz & Mona can fully assist you in this process. We have years of experience in establishing all types of companies in Dubai mainland, offshore and free zones. Our WhatsApp contact number is 971-56-9971225.